Paint the fret as usual first. 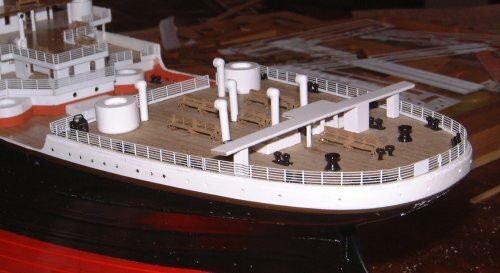 The stern rails go on first. 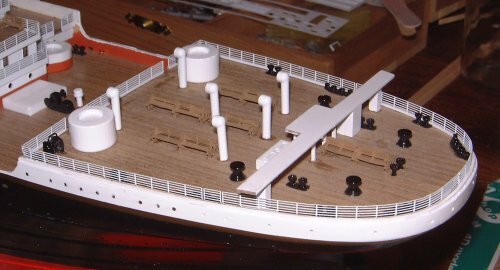 I also fitted the rails 18, 19 & 20 from week 83 which go along the front of the poop deck. The long rails need a gentle curve in them. I did this by rolling them over a pencil. You don't need to be very accurate as the bollards & bitts hold them in place. Test fir them in place, and check the length. I found I had to cut half the first section of rail off to make them fit. I did the two outer section of rail across the front of the poop, then the two long curved rails. Finally the centre section of the front rail was fitted so that the gaps for the steps were even. This went surprisingly easily. Just one thing to mention. When I glued the bitts in place I used a piece of brass etching as a spacer. The rails that I fitted had paint on one side (I'd scraped it off the side to be glued) so it was quite a tight fit. With hind sight I'd have used a painted piece of brass as the spacer, which would have made life a tiny bit easier. 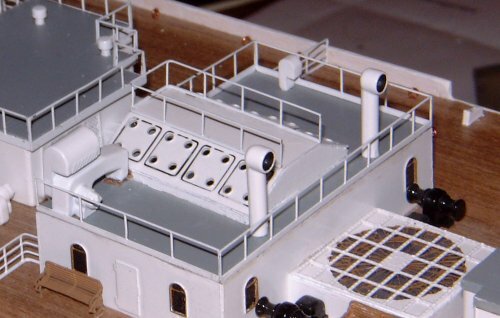 Here is the docking bridge support. Very straight forward to fit with super glue. I just needed to file a tiny fraction off the top to get it to fit nicely. 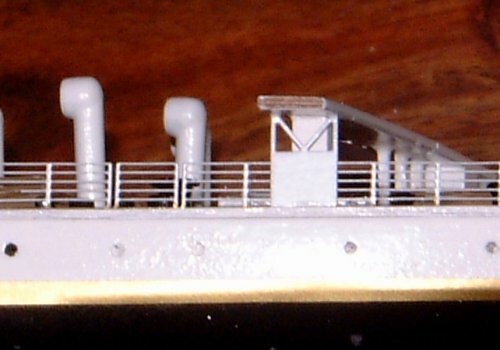 The remaining rails on the top of the engine casing were quite straight forward as well. Just more of the same. When you cut the parts out of the fret you usually leave a tiny 'snag' on the part. The can be removed with a needle file, be gently filing along the length of the part. 86 - Small panels to go int he deck once I've painted them.